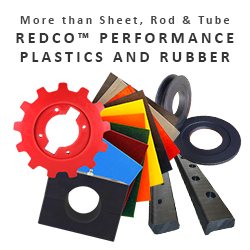 Redwood Plastics and Rubber supplies stock plastic shapes and custom parts to solve a variety of problems including shock, abrasion, noise, wear & friction. We carry many grades of industrial plastic and rubber in-stock for quick delivery, as well as engineer and fabricate custom parts that replace steel, aluminum, and wood for longer wear life, decreased downtime, and increase safety. We have the capabilities to mold, machine, and fabricate a wide-range of high quality, custom components. Contact our knowledgeable staff with any questions regarding industrial applications with plastics and for the most cost-effective plastic solutions.